What is Mega - H or What is Silica Hydride ? Known as one of the most powerful antioxidant in the world today, it also enables the essential hydration for the whole body. The founder himself, Dr Patrick Flanagan named his product (Mega-H) as 'Hydrogen is the fuel of life'. In his research study, he has found that those people who are living in higher regions such as The Hunza in Pakistan, Villacabamba in Ecuador, Baden-Baden in Germany, they seemed to enjoy better and healthy lives. They even increased their life span to 100 years old, on average. The answer was in the waters they drank, which were melted from frozen glaciers. In his research study, he has uncovered that there were an abundantly rich amount of negatively-charged hydrogen-ions (H-) present in such waters. Why do we take Mega - H ? Hydrogen is one of the essential elements which has maintained the development of all living things on Earth. Human beings are known to be silica and hydrogen-based, while all other living things are hydrogen-based. When plants absorb sunlight, it stores up negatively charged hydrogen-ions (obtained through photosynthesis). Thus, when you eat any unprocessed plant, your body’s cells will naturally absorb the nutrients in this plant. Therefore, when hydrogen and oxygen get to burn inside our body, hydration will occur and energy will be evolved to sustain life. Hydrogen is the smallest known molecule and able to reach every corner of the human body. High levels of free radicles are a major source of aging, including many types of acute and chronic diseases. Oxidated free radicle can damage our human cells just like rust to metal. Like a gang of thieves, free radicles run through our body stealing electrons from our healthy cells. Such action will cause damages to our cellular structures and DNA, leading to age acceleration, cellular deterioration and complicated diseases. Mega-H contains Hydrogen, a compound which contains loosely-bound extra electron. When it surrenders electrons to neutralize free radicles, it will return to its natural hydrogen state and does not become a free radicle itself. Besides, it also buffers a slightly alkaline environment for our body, which is ideal for the development and growth of healthy cells. It has been scientifically proven to be 800 % more effective than any other antioxidants such as Green Tea, Grape Seed Extracts, Vitamin A, C & E. One single capsule of Mega-H contains the number of electrons equivalent to that in 10,000 glasses of fresh organic orange juice. Human cells need hydrogen and oxygen to generate the energy to sustain life. The primary sources are fresh uncooked plants such as fruits, green vegetables and water. Because of worldly demand on food, inconsiderate activities such as mass food production, poor mineral-deficient soil, harmful pesticides, toxic chemical fertilizers, over-processing of foods, excess chemical preservatives added and drinking of over-chlorinated water, has deprived millions of human beings not receiving enough hydrogen ions each day. When there is a insufficiency, cells will be gradually damaged and the human itself will also die too. When certain chemicals in the body lose an electron, they become positively charged and becomes "free radicals" or "oxidants". Modern scientists have concluded that free radical damage in the human body is the main cause of human ageing. It happens when millions of the body’s cells are damaged through oxidation (due to a shortage of hydrogen ions for preventing free radical damage). The active ingredient in Mega-H is Silica Hydride. Water comprises of two parts of hydrogen atoms and one part of oxygen atom. Without water, life does not exist on Earth. Mega-H is one of the main products by Dr. Patrick Flanagan. No other product can perform better than Mega-H, in delivering and releasing billions of negatively-charged hydrogen ions into the body’s cells, by simply taking it with water. Mega-H contains the active ingredient 'Silica Hydride', a compound known to positively affect the "zeta potential" of blood cells. Zeta potential (x) is the electric potential, or charge, found in a hydrated particle and the surrounding solution. Zeta potential is an important and useful indicator that this charge can be used to predict and control the stability of colloidal suspensions. The greater the zeta potential, the more likely the suspension will be stable because the charged particles repel each other and thus overcome the natural tendency to aggregate. Zeta potential is an electrical charge measuring the microscopic distance between cells. Greater zeta potential thus indicates more space between cells. Increased zeta potential possesses many positive health benefits. More zeta potential means more surface area for cells. Toxins, viral matters, fungi, and bacterias trapped between cells can be expunged more readily. More importantly, water enters cells more easily. Water is arguably the most vital component of life extension and the removal of free radicals and waste. 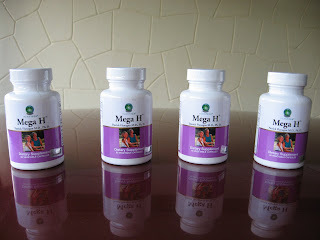 Mega-H is a dietary supplement that can also be classified as a food grade supplement, rich in antioxidants. It is safe and has been tested and exhibited no known side effects.